The Coil of the Pro Mag 44 is designed to handle the 44 amps being pumped into it from the generator and still produce plenty of high voltage. The coil is capable of delivering up to 50,000 volts to the plugs which is responsible for initializing the spark across the plug gap as the long duration energy glows in the cylinder. The 44 Coil features over a pound of copper carefully wound around a unique bobbin molded from Dupont Rynite FR946 material. These windings and internals of the coil are completely encased in epoxy for incredible protection against vibration damage and ensure the ultimate in reliability. 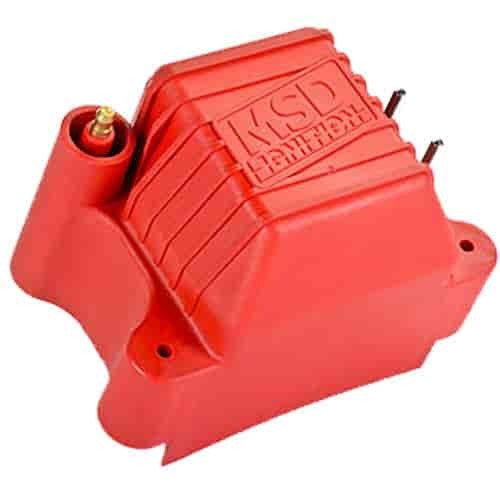 This entire assembly is housed in a tough plastic molded shell with extremely high voltage isolation characteristics. Brass primary and secondary terminals ensure full voltage delivery and vibration mounts are included.